CYP3A4 Enzyme | Everything You Need to Know About CYP3A4! CYP3A4 Enzyme | Everything You Need to Know! What is the CYP3A4 enzyme? During your study of medicines, you will inevitably come across CYP3A4. CYP3A4 is one of the most important enzymes in medicine; an enzyme responsible for the metabolism of more than 50 percent of all medicines. That’s no exaggeration. CYP3A4 is an enzyme that comes with an enormously powerful biological and medicinal impact. That’s why learning about CYP3A4 is so important. Of course, CYP3A4 is just one enzyme among the broader family of CYP450 enzymes – a system of enzymes (hemoproteins) responsible for 75 percent of drug metabolism. Some members of the family have a specific function. For example, the CYP24 family is responsible for vitamin D degradation. Others, such as the CYP7 family, are involved with the biosynthesis of bile acid. But it’s that specific enzyme, CYP3A4, that concerns us today. CYP3A4 is predominantly found in two places – the liver and the intestine. However, it takes time to fully establish CYP3A4 levels in the human body. There is no CYP3A4 in fetal liver, for instance. By the end of the first month of life, CYP3A4 levels increase to approximately 35-45% of an adult and, by the end of the first year of life, those levels rise further to approximately 75%. Though CYP3A4 has an important role in drug metabolism, it can also play a role in drug activation. Drugs may be metabolised to their active form by intestinal or hepatic CYP3A4. For example – the antihistamine (and prodrug) terfenadine is metabolized to its active form, fexofenadine, by CYP3A4 in the liver (terfenadine has since been discontinued due to the risk of arrhythmia-QT prolongation). Foods can also influence CYP3A4 performance. For example – grapefruit juice is a powerful inhibitor of CYP3A4. When taken with grapefruit juice, drugs metabolized by CYP3A4 have a higher bioavailability and therefore a higher risk of adverse effects and a negative impact on efficacy. When we say that there are “substrates, inducers and inhibitors” of CYP3A4, what do we mean? Let’s suppose that a CYP3A4 substrate (in this case, citalopram) is administered alongside a CYP3A4 inducer (in this case, carbamazepine). The inducer, carbamazepine, enhances the activity of CYP3A4 – meaning that it enhances the metabolism of citalopram. The faster the metabolism, the less citalopram available to exert its therapeutic effect. The opposite case can be made for CYP3A4 inhibitors. For example – clarithromycin is a strong inhibitor of CYP3A4. Reduced activity of CYP3A4 means that substrates of CYP3A4 are metabolized slower – leading to an increase in substrate concentration and an elevated potential for drug toxicity. Drug interactions between substrates and substrates / inducer, then, has important – often serious – clinical effects that students need to consider. However, we also need to put CYP3A4 drug interactions in perspective. Given that CYP3A4 is responsible for the metabolism of well over 50 percent of drugs, it’s not reasonable for students of pharmacy, medicine or nursing to commit each drug interaction to memory. As you proceed to practice pharmacy case studies, many of the below drug interactions will come to you over time. You’ll find that certain drug interactions appear more often than others, that some drug interactions present a more serious hazard. So, while learning the various substrates, inducers and inhibitors is important, try to learn interactions from a clinical perspective rather than learning never-ending lists of drugs. By taking this route, your study becomes more productive, more insightful and – in the end – more successful. That these lists are not intended to be exhaustive. Drugs are often metabolized by more than one route / CYP enzyme. Nonetheless, these tables offer a glimpse into the pervasiveness of CYP3A4. Remember – “substrates” are drugs metabolized by the CYP3A4 enzyme. Remember – “inducers” are drugs that enhance the activity of CYP3A4. Remember – “inhibitors” are drugs that reduce the activity of CYP3A4. Learning about CYP3A4 doesn’t need to be difficult! As the most important enzyme in drug metabolism, CYP3A4 deserves your time and attention. Once you grasp the fundamental concept of what CYP3A4 is, where it can be found, how it works and how it influences drug interactions – the rest comes with time. Committing important CYP3A4 interactions is easy with pharmacy case studies. Case studies expose you to all manner of drug interactions based on real-life, clinical situations. The more case studies you practice, the more interactions you encounter. After all, CYP3A4 – by metabolizing over 50 percent of medicines – invariably plays a significant role in many of these interactions. 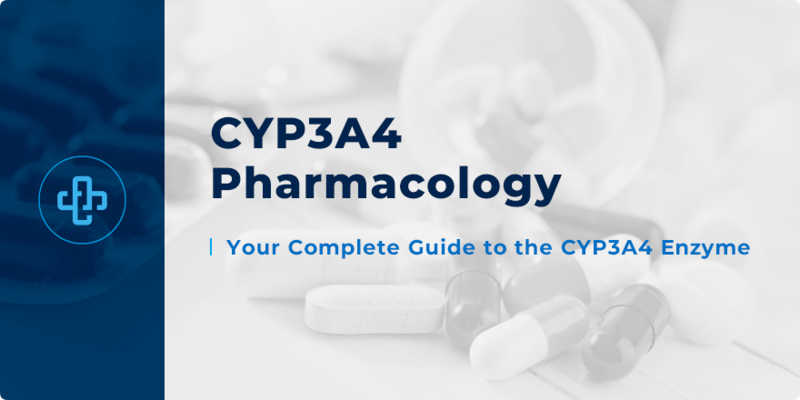 Check back to our pharmacy blog soon for even more great facts about CYP3A4, drug metabolism and much more. Also, take a few seconds to join our newsletter (above) to receive all the latest facts direct to your email!